StP Gruppe Mont St-Frieux Complex, K.V.A. 'D1' Hardelot - Merlimont. StP Mont De Terre, Battr.5./A.R.149. StP Mont ST Frieux, Stab 1./H.K.A.R.1245. Stab II/Gren.Rgt.148. StP Höhe 158, Mont St Frieux H.K.B. 4./H.K.A.B.1245. Flak.Abt.501. StP Südostecke, Mont St Frieux est. A very powerful 'Stützpunkt Gruppe' situated on the top of several very high sand dunes between Hardelot-Plage and Dannes. There are many different types of bunkers and open gun emplacements, radars and lots of bomb craters. The red circle is where we visited. 6 x Vf59a Obs. post. 5 x Vf2a Group shelter. 1 x V556a Dressing station. 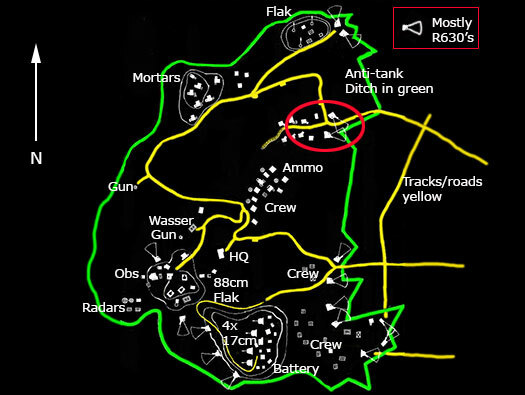 4 x Geschützstellung (open emplacement). 6 x Vf59a mortar Tobruk. 4 x 10cm le.F.H14/19(t) guns. 1 x R646 Water bunker. 1 x R657 Kitchen bunker. 1 x 658 Water bunker. 1 x R119 Battery commanders bunker. 2 x R135/SK Ammunition bunker. 3 x 8.8cm Flak 18. 1 x 3.7cm S.K.C/30 Flak. 1 x Würzburg See Riese Fu.MO214. 8 x R630 Machine gun casemates. 3 x R631 casemate for a 4.7cm Festungspak (t). 1 x R676 small casemate for a 4.7cm Festungspak (t). 1 x R620 Machine gun casemate with forward apron. 2 x R680 casemate for 7.5cm Pak 40 gun. 1 x R612 casemate for an assault gun. 1 x 7.5cm FK guns. 2 x 4.7cm Pak K.36(t). 2 x 7.5cm Pak 40 gun. Bombing. The red square is where we visited so you can see how large the site is. The area was heavily bombed from around D-day onwards. The RAF used their Lancaster, Halifax's and Sterling force. The USAAF their Flying Fortresses and Liberates also both air forces used medium bombers as well. Bombed bunker at Batterie Crisbeq in Normandy showing what bombing can do to a bunker. 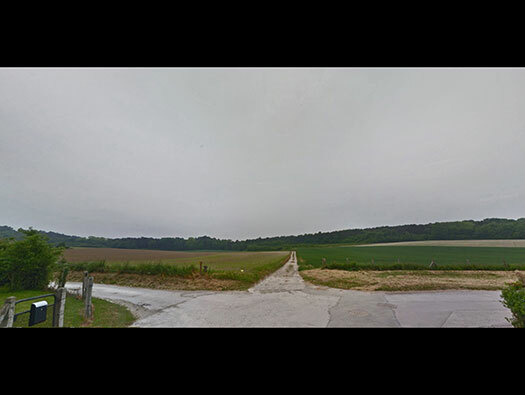 This is the road we drove up and Mont St-Frieux is the hill on the left side and Mont de Terre on the right. The R630 bunker is defending this way in. 4 x R689 casemate for a 17cm K18 heavy artillery gun. 4 x 17cm K18 heavy artillery gun. R630 machine gun casemate with an armoured plate. 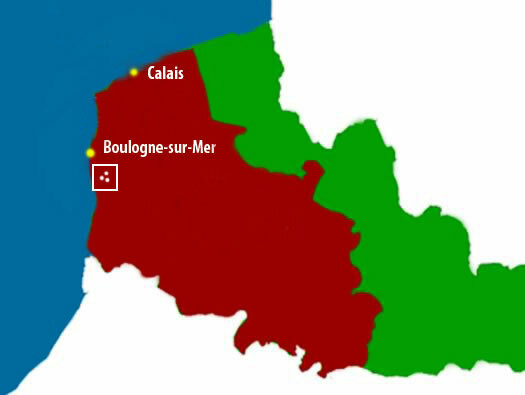 Here somebody has acquired many artefact from the area around St Frieux and also along the coast and made a small free museum. A one man guard post that would protect the guard in an air-raid, he could duck inside. There would be just enough room for a wooden seat for him to sit on. This type was made by the Todt organisation in France I believe. This model had a door again made of concrete and also could be bolted down on a ring of bolts to stop it being blown over by blast. The large flanking wall covering the embrasure from fire from on the right flank where an attacker may have advanced. The flanking wall in action. Rommel is inspecting beach defences. The metal plates were all removed post war as war reparations. The French government allowed all Mayors to scrap metal within their boundaries and use the moneys to help repair their war torn villages/towns. Panzerschartenplatte is the red line set into the embrasure. MG34 mounting for a Tobruk. Tobruk used in the anti-aircraft role. The metal plate has been removed and now replaced with a thin sheet. 442PO1 Close combat plate the type that may have been here. 48/39 is the bunkers number. Steps down into the bunker. Another close combat defence covering the entrance. A 434P01 heavy steel double door fittings. The close combat room was sealed off with a 434P01 heavy steel double door. A 434P01 door with the top door open. Command cables coming into the bunker connecting all the defence bunkers on the Mont so that a mutual defence between each bunker and the head quarters (Battle HQ?) could be run for their mutual support. Layout of a bunker telephone. Here is where the crew of about six men would live. Note the different colours on the far wall. On the left is the emergency escape. On the floor is a fresh air pipe. Bei Gasgefahr verbindungsstück mit O herousnehmen Ruumfilter einsetzen. Not a very good translation but basically "In the event of a gas attack connect the rooms gas filter"
Anti gas pump in action. There were also a smoke filter in-case of fire. Close combat covering the entrance stares. Possibly a speaking tube connected to the Tobruk. Kampfraum - Battle Space (Tobruk) speaking tube was connected to the Tobruk defence via a pipe set into the concrete when it was built. A sprachrohr (mouthpiece) set into a Tobruk. Shutters that closed off the escape. 410P9 escape door now removed. Also the passage to the gun room, it was where spare ammunition would be stored and also a periscope fitted to help spot for the machine-gun. Ammunition boxes for machine gun belts. The tube where the periscope fits through. Almost managed to get the focus correct. A 19P7 door was fitted here a thin steel gas tight model. Under attack this would be a very busy room. Crew of a bunkers gun in similar type of bunker. A large anti-tank ditch zig zagged through the fields from the far trees, across the front and off to the left side. Bringing in air from outside and being filtered by the hand turned filtration pump and then distributed around the bunker making the bunker slightly higher pressure stopping any ingress of gas that may be around and filtering the gases out. Gas mask and box that all German troops carried. Where the crew lived with bunk beds hanging from the walls, a gas filter pump, a stove to keep them warm in winter and cupboards for their personal kit. Putting in beach defences. The infantry platoons in the beach side defences worked very hard putting items like this type and wooden posts topped with teller mines, etc. We did climb the fence and go inside. This area is strictly closed to the public and an area of hunting. Wild Boar roam freely as do wild Highland cattle. In the summer there are ticks. This was Autumn so at least no Ticks. We should not have BUT well an old fool is always an old fool. We entered and found a couple of bunkers but then decided better to leave. It would be nice to have an arranged tour of the area run by a local historian. Perhaps one day. The yellow roads on the plan are nearly all concrete roads probably built by the Todt organisation or even army engineers. Continuing in on the Military road. This is a beautiful area, full of wildlife and in the Autumn, Toadstools. This area is made up of large sand dunes now covered with a thin layer of grass and pine trees. The first bunker that we found. An R668 small six man bunker and may have a Tobruk? Numbered 60/50. The first bunker on the right of the road would be a Wellblech but we did not find it. We started to enter the 668 BUT there was a awful smell. The next is a rare one for me an R657 56/59 a two kitchen bunker. Again we did not enter and now I kick myself for not doing that as I have never seen inside one. R657 a two kitchen bunker. R657 field kitchen plan with the field kitchen in place. Field kitchen being worked on..
Two field kitchens could be wheeled in and their chimneys connected up and then potatoes peeled. Spud peeling a soldiers main occupation before training and fighting. You cans see how many bunkers are just in this area. Now we are heading south the R630 arrowed. Between here and the R630 there was an anti-tank ditch zig zagging across the fields. 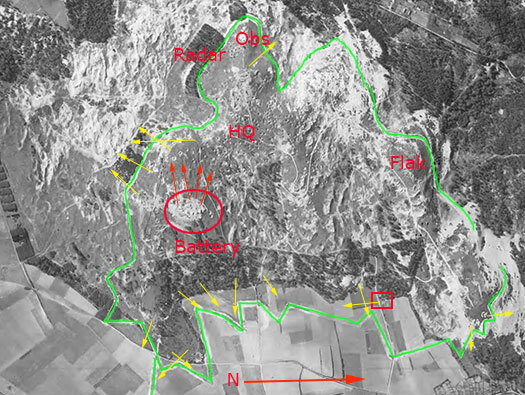 The green line is the anti-tank ditch. Anti tank ditch on Omaha Beach. This is the actual anti-tank ditch taken on a reconnaissance mission in 1944. This is another road onto the Mont. The roads on the Mont. R689 casemate camouflaged up on the hill..